Who Would Trade Away These Trade Show Statistics? Most business owners have an inkling of the boost attending trade shows can give their companies, but they do not have the specific numbers to back it up. 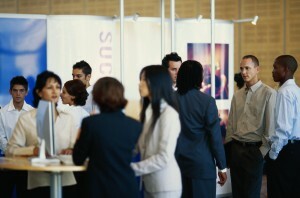 Luckily, the big-time benefits of trade shows can be quantified and have been in a recent study! Read on to learn more about the impressive trade show statistics that prove your business should be investing in an expo experience. Do all trade show attendees have buying authority? Not necessarily all, but a huge chunk- 81 percent!- of attendees are authorized to make purchasing and deal-making decisions. That means that when you attend a trade show, you are almost always going to be speaking face-to-face with someone who is capable of creating a significant connection with your company then and there. Do trade shows give you a national profile? With nearly 78 percent of trade show attendees visiting from over 400 miles away, you certainly will get your company’s name out there on a country-wide scale! This can be an especially beneficial thing for startups and smaller companies to take advantage of. Do trade shows impress more than other marketing methods? This is a trade show statistic you are sure to love: 99 percent of attendees reported that the unique value their trade show experience brought them was something they did not find with other methods of business marketing. It’s understandable, too; trade shows put you right in front of your potential clientele, giving you the real-time opportunity to explain the work your company does. Taking advantage of the many benefits of a trade show is one thing; getting to one is another. It is important when planning your company’s trade show experience to deal with a company that knows what it’s doing when it comes to the logistics of a show. That is why AFP Expo, AFP Global’s trade show-specific division, was created: to help businesses organize a flawless trade show exhibit that will catch the eyes of every attendee there. Get in touch today for more information! For a customized logistics handling experience that places your needs above all else, AFP Global Logistics is the best and only choice! Our AFP Expo division is specifically designed with your trade show needs in mind. For more information or to start designing your own logistic solutions today, get in touch with AFP at 410.590.1234 (toll-free800.274.1237), email us at expo@afplus.com, or fill out our quick and easy contact form here! This entry was posted on Thursday, March 26th, 2015	at 12:21 pm	and is filed under News, Trade Shows	. You can follow any responses to this entry through the RSS 2.0	feed. You can skip to the end and leave a response. Pinging is currently not allowed.